Everyone knows that you have to take care of your vehicle if you want it to last. You keep a check on the fluids, change your oil and tune it up to make sure it’s ready for the road but many times, people forget about the tires and alignment. Drivers tend to concentrate more on the engine and transmission to ensure the vehicle is in good running condition. While this is necessary, your tires and alignment are just as important. Take the time to check your tires to make sure they’re in good shape and if you suspect it’s out of line, have it checked out by a professional. Proper maintenance includes having good tires and proper alignment. Your tires are the only thing connecting your vehicle to the road. If they’re slick and worn, they become a safety hazard. Slick tires affect the way your vehicle handles and the way it stops. They won’t grip the road as well making it easy to lose control, especially on damp or wet roads or when going around curves. When you apply the brakes, the vehicle will slide instead of stopping, which could also result in an accident. Hitting potholes, the curb or some type of debris in the road can knock your wheels out of alignment. When this happens, it makes the vehicle harder to control and increases the risk of being involved in an accident. Driving a vehicle that is out of line will also wear your tires out faster leading to other problems, so it’s important to get an alignment at the first sign of trouble. If you notice your car is pulling to the side, the steering wheel is not centered or your tires are not wearing evenly, then you probably need an alignment. 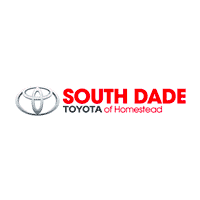 Buying a car is a big investment and here at South Dade Toyota, we want to help you protect your investment whether it’s a new or used Toyota. Our certified technicians can check your tires for excessive wear and make sure it’s aligned properly. Simply driving your vehicle will wear down your tires over time but there are ways to extend their life and keep them in good shape longer. In addition to keeping your wheels aligned properly, keep a close check on your air pressure. Check the manual or the sticker inside the driver’s door to learn how much air pressure you should have in your tires, since it is different for different types of vehicles. Over or under inflated tires will cause them to wear out faster, make the vehicle use more fuel and it can also cause a tire to blow out resulting in an accident. It affects the way the vehicle handles and it could make it difficult to maneuver quickly if the need arises. To avoid these problems and to extend the life of your tires, check your air pressure regularly using a tire gage because you can’t always tell if tires have the right amount of pressure simply by looking at them. Inspect your tires regularly to look for excessive wear, cracks, splits and foreign objects that could cause a flat tire later. Check the tread depth and make sure the tires are wearing evenly all the way around. Replace your tires immediately if you find signs of excessive wear and before they become slick. Maintaining proper alignment and keeping your tires in good shape will improve performance and keep you safer on the road.